LeapPad Plus Writing Learning System teaches fundamental reading skills, plus writing and math. By using the dual-function, interactive Magic Pencil to switch from writing mode to non-writing mode, children can sound out letters and words, read stories AND write. Includes 2 books. The Interactive Book teaches reading, phonics, vocabulary, science, foreign languages and geography. The Interactive Writing Book teaches writing letters and numbers, phonics, writing words, addition and subtraction and drawing shapes. 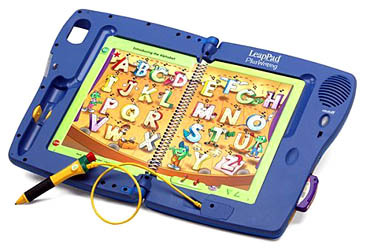 The LeapPad Plus Writing Learning System works with the entire LeapPad Library.